Andras is small and simply built - his only distinguishing structure is the slight curve to the bridge of his nose, and even that isn't particularly impressive. While the easiest way to describe his build is 'generic' and 'slightly androgynous' there are traits--the gentle curve of his face, large eyes, slightly smaller nostrils, the crest of his neck--that call to mind a welsh pony if it was perhaps given a little extra height. His wings are flexible and corvid, fingered much like a vulture's. Andras has a roughly 14 foot wingspan. 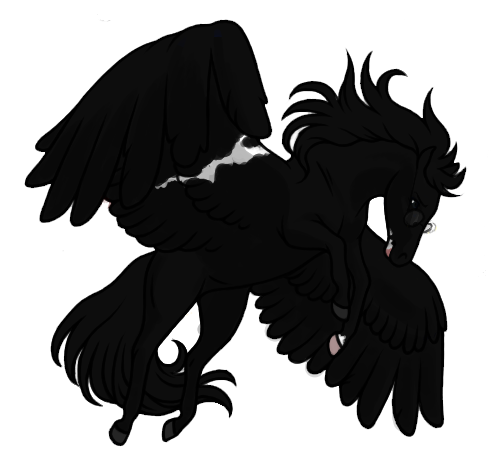 Stygian and smooth, a majority of Andras' body, including his wings, is a uniform and light-swallowing black. It is broken up only by splashes of white on his chin, right wing, and left foreleg. The marking on his chin leaves his lower lip pink, often the only place on his body you can see the regular bruising he endures, and does not touch his upper lip at all. Those lips are almost always pressed into a bitter frown. The marking on his wing is a forked bolt of white, starting from the "bicep" and just barely flickering onto the primary feathers. On his ankle is an irregular coronet that almost fails to rim the single pink hoof but creeps up toward the inside of his ankle. Andras' glasses are round with thin, black, metal rims. The lenses treat a mild astigmatism. He doesn't wear them all the time and in fact loses them more than he'd like to admit, but it gives him headaches to go without them for too long, as things in the light have a blurry quality to them. A horse that walks with varying levels of fury in every step. Brows almost perpetually lowered, his blue-gray eyes glaring up from beneath them. It's rare that Andras' head is carried much higher than his withers or that he is not wearing an expression of prolonged suffering. The problem with Andras is that he has too much inside of him, and most of it is volatile. He was not made to be a weapon but he likes being one. There are few things that bring him to life like bruised and bloodied knees or the way a blade sings through the air. He’s a good solider, punctual and serious; his face is often drawn into sharp edges and tight lines, the hallmark of a creature bent out of the shape it was made for, the stamp of a man who was out of time the day he was born. There has always been something driving Andras to do, do, do, but there has never been a voice that asks him to be. He doesn’t know how to just be. He has tried to learn but Andras is a tightly-coiled spring and the tension of him is too much for any calm thought to break through. This is perhaps why he is prone to doing regular and acrobatic pirouettes off the handle. At rest, Andras is friendly if severe, but any unexpected changes or difficulties often send him into a panic and he panics like you might imagine a cobra would, or a badger, or some other small but very angry animal prone to acting out. He is trying to learn how to cope. He is trying to lay down his weapon and be less defensive. He is trying to forget that he has been one prolonged snarl for his entire life and find some peace in a world that he very rarely understands. It is not coming to him easily. "You want to be a soft child, but you are not. You came out of your mother with your fists clenched, screaming and covered in your mother's blood." Andras’ mother would say that he was born angry, and add that he would probably die angry, too. He was stoic as a child, almost too stoic, and when he finally opened his mouth it had only been to screech. He may have just been born off-kilter; there was no defining point in his history that made him what he was, but with four brothers, all older than he was, each and every sentence of his biography is punctuated by some minor act of violence, either by or against him. His mother would tell you, with some amount of strain in her voice, that she remembers when he broke his oldest brothers’ leg in some argument that started as a joke and very quickly became very serious (as it often does with Andras). She would recount next, as she always did, that Andras dragged him all the way back home and seemed scared. She thinks this is the first time he realized there was something wrong. She would mention, too, that it had not been the first time she thought this. That came later, when Andras would disappear for days at a time and come home bruised and bloody, refusing medical attention. Or when he went off to war and the letters that came home were always troubling in a way she couldn’t quiet place, before they started coming less and less often, and then not at all. She assumes he must be dead. She worries, of course she worries, but she thinks that may have been what he wanted all along. What happened, though, was far from that. Andras had thrived. Ever the contrarian, his problems had instead begun the day the war ended. You see, a soul can only be so many things in a lifetime and Andras’ is perhaps more restricted even than that. A lion cannot lay down its mane and a dog cannot lay down its teeth and in that vain Andras could not just lay down his sword and go back to normal, whatever that is. He had been birthed into rage and the battlefield had been his cathedral, within which each drop of sweat was a hymn and every bruise was the word of god. He cannot just go back to normal. Andras hadn’t returned home for no other reason than he didn’t want to. Andras had tried to find peace, had picked up some books on magic and found that he was full of too much chaos to find whatever lived within him that could call it forth. It was perhaps merciful that he was plucked from his own reality and dropped unceremoniously into this one. Cannon is addicted to troubled boys with lots of feelings, I guess. and told you to find peace.